Web Source: These photo's have been grabbed from the web and have been edited but show the variation of the emblem and additional unit no's. I'm sorry I was in France for a couple of days. 1/ Hummm this picture is better than the previous one. 2/ I have, more or less the same caption than yours. 3/ Eggers was 2./JG 21 Staka, not von Holtey. 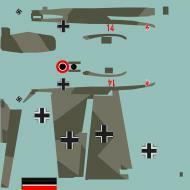 4/ Von Holtey is in JG 26 loss list, not JG 21 or JG 54. COD skins by Matthew Laird Acred. One book say's the no 14 could be red but I believe it Black but shows paint overspray and is a little missleading but if you look at the prop which is Black, White and Red the colours show the no's as being Black not Red. Remarks: One known victory, a Polish P-24 near Warsaw on 6 September, 1939, while he was Stfkpt 2/JG-21. 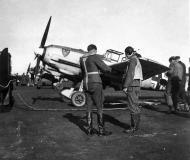 His 2nd & 3rd, a Hawk-75A at Cambrai and a Hawk N of Douai, 26 May, 1940. His 3rd, a Blenheim NW of Horn on 2 July, 1940. Egger served in 13(Pz)/JG-51 in August of 1942. 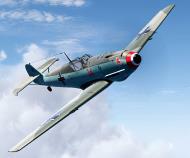 (This unit was later redesignated 14(Pz)/SG-9 on 18 October, 1943) flying the Hs129. In February of 1943, he commanded I/JG-102. Remarks: Werk# 5819 had been one of Galland's AC, which he crashed at Ijsselmeer Holland on 11 May, 1940, cause unknown. His one known victory, a Fokker XXI over Amsterdam, shared with 3 others, 10 May, 1940. (Walter Schneider, Walter Meyer & Han Wemhöner). His 1st complete victory, a Blenheim over Senden, SW of Münster, 5 July, 1940. His 2nd, a Blenheim south of Vlissinghen on 12 August, 1941. 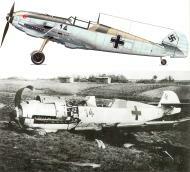 He was injured in a crash S of the Zuider Zee on 11 May, 1940 in a Bf 109E.